This perfect fragrance was created with an icy spirit. 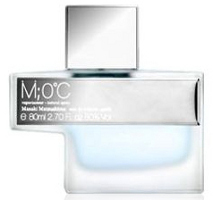 Lively, invigorating, turquoise blue M;OºC is a creative and elegant fragrance. The cool facon confirms its cool citrus-woody scent. When spraying the freezing effect of this fragrance suffuses a delicious apple sorbet scent. The fragrance notes feature green apple sorbet, glory of the snow, chimayo cocktail, teakwood and musk. Look! It’s BLV II with a bite out of the bottom and a square cap. Not to nitpick, but turquoise blue has green to it…that looks pretty ice blue to me. And you can keep your apple, sorbet or otherwise. Shame though…I’ve done somewhat better w/this line than Bvlgari (though I’ve tried fewer, so perhaps not a fair comparison). He’s been using that bottle shape for some time though…so not a recent copy, at any rate. No, I know; it was the combo of the bottle and the color, really. They’re nice, icy-blue flowers (mine never come up in the snow), but they don’t have any scent that I can detect. Maybe this note is supposed to smell the way a cool-blue flower looks. And what’s a chimayo cocktail? I gather the name is for “Men; zero degrees centigrade”, but why a semicolon? These “creative” uses of punctuation can get old. Wow, I only knew of Chimayó as the fabulous place in New Mexico (though I saw nary a drinking establishment). But yes, it’s actually a cocktail (thanks wikipedia). Rather foul-sounding in my opinion: 1-1/2 oz tequila with 1 oz unfiltered apple cider, 1/4 oz fresh lemon juice and 1/4 oz creme de cassis over ice. I’m not lemming this fragrance. I am not lemming that drink, either. Oh, ugh. I mix a mean cocktail, but I’ve never found any liquor that combines well with cider. Tequila, cassis, and cider sounds like a recipe for a toilet-hugging disaster. I think strange punctuation is kind of a Japanese thing. Look at Japanese band names/album names/song names, names of anime/manga series, etc. and so forth. It’s just the way they are. Oh thank God – I thought they had finally gone over the bend in describing a water accord. They didn’t, but someone will. Just wait. I’m really tired of green apple too. Wow, I’m really digging the bottle. Who cares about the juice? It would lok great next to one of my Ikea lamps. Ok…so…looks like I’m the only one that actually likes the idea of this scent! I like the smell of apples (don’t like the Be Delicious stuff though) and it does sound a little different to the standard male fare so if I see it I’ll definetely give it a squirt. Well you’re the only one commenting to say so, but that doesn’t mean you’re alone! I would guess it will be at Sephora eventually? MM isn’t easy to find in the US otherwise. Well, I suppose it can’t be in every fragrance?